Our high season has crossed its midway mark and we are delighted to share with you our trendiest cabins this summer. First of all, we are very happy that our new 2016 garden room models with verandas for Al Fresco dining and hot tubs were welcomed very warmly by our customers with 5 of them making the top 10. 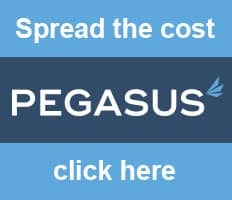 Secondly, another big change this year is that we have noticed the growing demand for cabins with thicker walls and double glazing to add some extra insulation, so you can use garden buildings for most part of the year or even all year round. 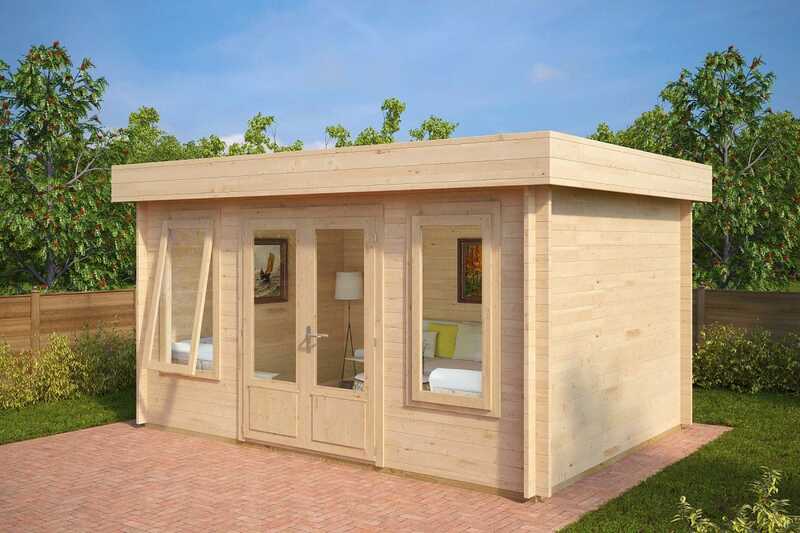 The Eva E with Veranda is one of our newest garden rooms. 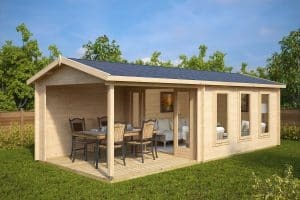 The Eva E garden log cabin has 3 x 4 m space inside perfect as a family summer garden room and 9m2 veranda for BBQ’s and hosting garden parties. It features 44mm walls, double glazed windows and impregnated decking that are all included in the standard price. Although it is just 2 years since this contemporary garden room was introduced it seems to us to already be a timeless classic. 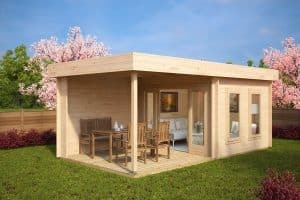 The Hansa Lounge XL garden log cabin has two large panorama windows that open up to a view of two sides of your garden. “Hansa” designs have a spacious veranda which offers a superb place to make your summer days brighter. 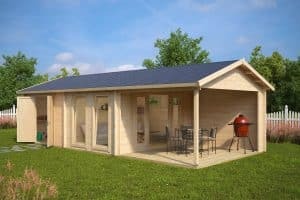 Whether you are after a spacious garden room or a stylish garden office, this DIY garden log cabin is definitely worth considering. 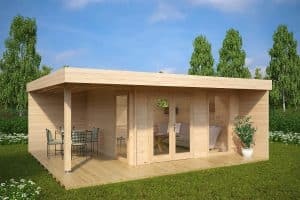 Jacob D DIY garden room is our premium seasonal garden building. All cabins with single glazed windows are mostly for seasonal use, but 40mm wall thickness with double tongue and groove wall planks, metal rods for extra wall strength and metal storm braces make this cabin very sturdy and long lasting. The Lucas E and Nora E are two identical garden rooms. Same 9 m2 inside, sliding doors and 3x3m veranda. The Nora cabin has an apex roof and the Lucas E comes with modern looking flat roof. 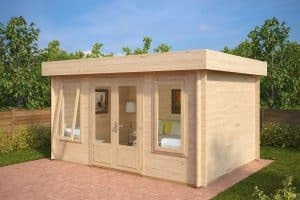 Both of these cabins are great fit for smaller gardens because you can have a garden room and outdoor dining area on just 6x3m of space. The Robin is our bestselling 3 in 1 large garden building. It has three 12 m2 equal parts: an extra-large storage or DIY room, garden living room and veranda. Furthermore, this large garden log cabin has 28mm floor boards, 50mm wall planks, 94mm foundation joist, double glazed windows and doors all in the standard kit.